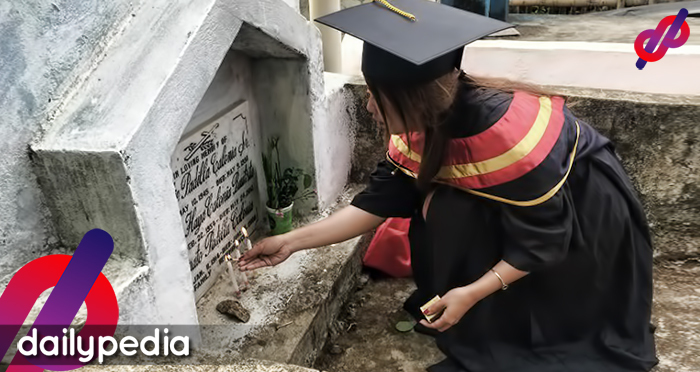 A college student from Cagayan de Oro visited the grave of her parents before her graduation rites. Mayer Mia Bautista, 21, wore her toga before her solemn investiture on Wednesday, as she presented herself to the tombstones of her mother and father. “Treasure your parents,” she said in a report by ABS-CBN News. Bautista wanted to dedicate her achievement of finishing a degree in Bachelor of Science in Technology and Communication Management from the University of Science and Technology of Southern Philippines (USTP) to her deceased parents—a struggle she faced alone and ended up triumphant, even when she was orphaned early on. Her mother died of stroke while her father succumbed to pneumonia two years later. Three years ago, her sister also left her, forcing the young woman to rent a place of her own while continuing her education. Due to this, she had to sell snacks and pre-loved clothes at school to make ends meet. “It was challenging for my part dahil ako lang. I woke up every morning na ako lang. I have so much achievements, teachers would say you are a good leader, you did it but I want that galing sana sa parents ko,” described Bautista. Bautista used to be an academic scholar on her first year of college, but eventually lost it as she shifted to another course. Fortunately, she received another scholarship from the Commission on Higher Education and educational assistance from the Department of Social Welfare and Development. The hardworking and tenacious student claimed that she would like to be an inspiration to others for them to still continue achieving their dreams, even without their parents.